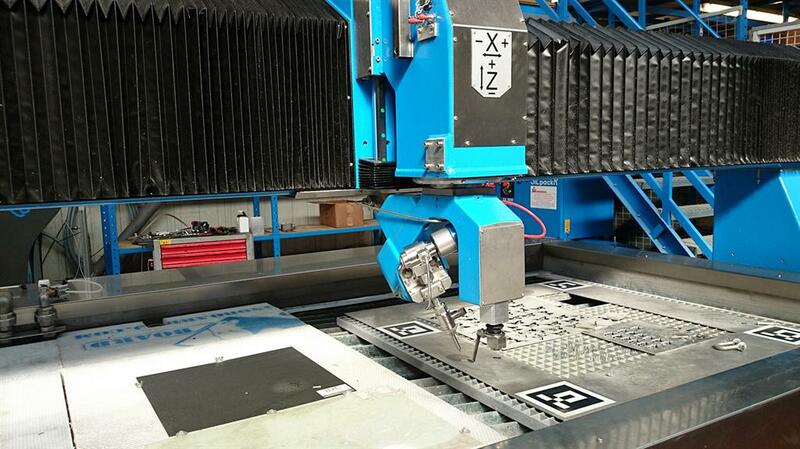 Considering 5-Axes Waterjet Cutting Systems, the space for the cutting head often is quite limited. 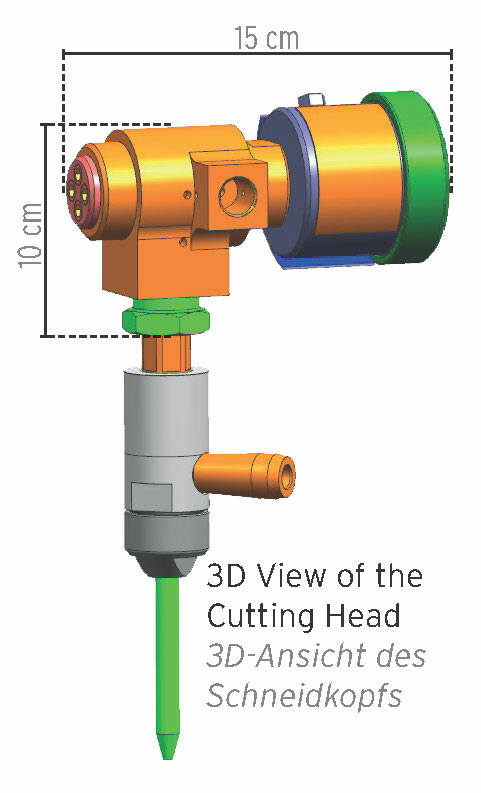 KMT Waterjet Systems now offers a solution for such constricted installation locations: a compact and flexibly applicable valve assembly for cutting heads. In cooperation with a customer, KMT designed a mini cutting head for application in waterjet cutting systems with multiple axes, which are necessary to realize angular and cone-shaped cuts. Besides this, the new development is a perfect fit for any kind of application with limited space for the installation of the cutting head. The company could achieve the compact dimensions due to the construction of an extra small pneumatic valve consisting of a mini actuator and a valve body. The outlet is a specifically developed nozzle tube which is mounted in a 90° angle to the actuator. Thus, the complete assembly group measures only 15 cm (about 6”) from the cover of the N/C actuator to the retaining nut of the valve body with an installation height including the high pressure connection of less than 10 cm (about 4”). The valve assembly can be used in waterjet cutting systems which operate at a maximum pressure of 4,100 bar as well as in systems with a pressure range of up to 6,200 bar. And it proves to be quite flexible: Any component with a 3/4” connection can be mounted to the nozzle tube. Of course, the assembly group is compatible with other KMT high pressure components and can thus be easily integrated into an existing system. For the pressure range of up to of 4.100 bar, KMT recommends the installation of an ACTIVE IDE II cutting head; for applications which run at a maximum of 6,200 bar, the model types ACTIVE AUTOLINEPRO or ACTIVE IDE PRO are the components of choice. The technology of waterjet cutting at the ultra-high pressure range of up to 6,200 bar has successfully been used in the industry for a few years now and has stood the test of long-term operation. So now it is time to have a close look at the advantages of this innovative technology and in particular at its potential for cost savings. Dependent on the material, the cutting speed can be increased by 50 % or even more without any loss in cutting edge quality. This holds true for straight cuts but also to an even greater degree for corner cuts. KMT Waterjet Systems carried out a test series with a complex work piece made of mild steel (thickness: 30 mm) producing very positive results. The tests verified the fact that waterjet cutting at 6.200 bar can lead to considerable cost savings.